We have tried to provide everything that you could need for a comfortable holiday so that all you need to bring are towels, tea-towels and bed linen. If you don't want to bring your own bedding we can make up your beds using our own bed linen for an additional charge of £15 per double bed and £10per single bed. We can also provide a towel pack at £5 per person which includes a beach towel, a bath towel and a hand towel plus tea towel and bath mat for the caravan Please ask about this when booking the caravan. July weeks still available but sorry no short breaks during School holidays. 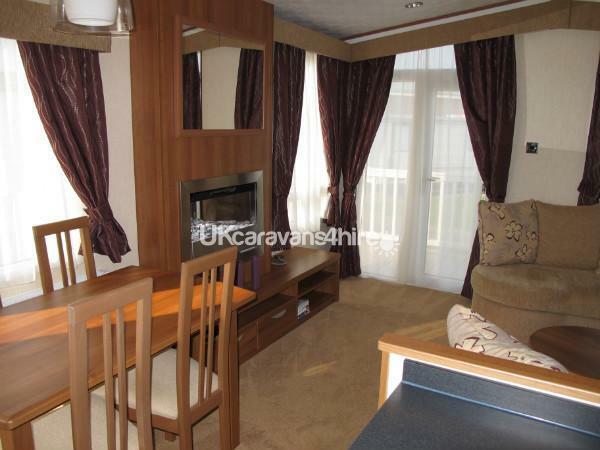 This three bedroom modern caravan has everything you need for a comfortable holiday. From the very spacious main bedroom complete with en-suite, two toilets, fitted fridge/freezer, central heating and double glazing and french doors leading out to the very spacious veranda, we feel that this caravan will give you all those extra luxuries that help make your holiday special. The comfortable lounge area has plenty of seating, with French doors leading outside. There is a large flat screen TV with free-view and built-in DVD player. We also have a PS2 player with a selection of games. 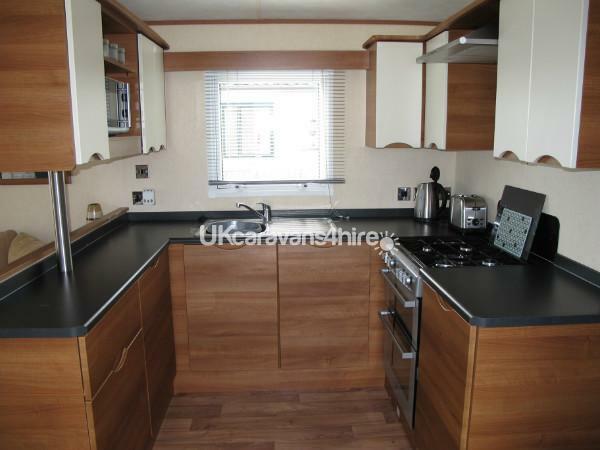 The kitchen has lots of cupboard space with a large larder fridge/freezer and the extractor hood means that no cooking smells linger or spread to the rest of the caravan. It is well equipped with microwave oven, electric kettle, toaster, crockery, glasses, cutlery, pans, bowls etc. 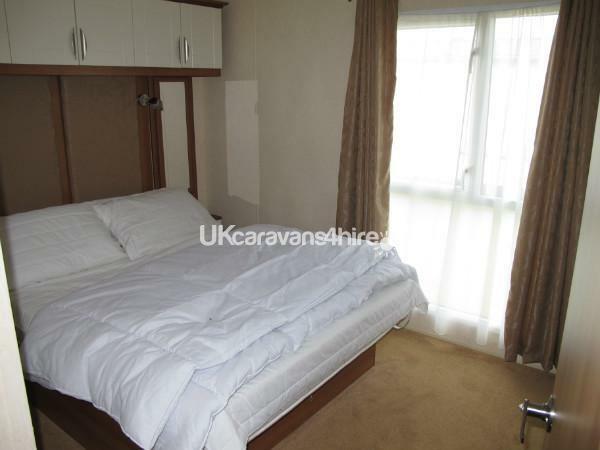 •Bedroom one extends the full 12ft width of the caravan giving you lots of room to move around. 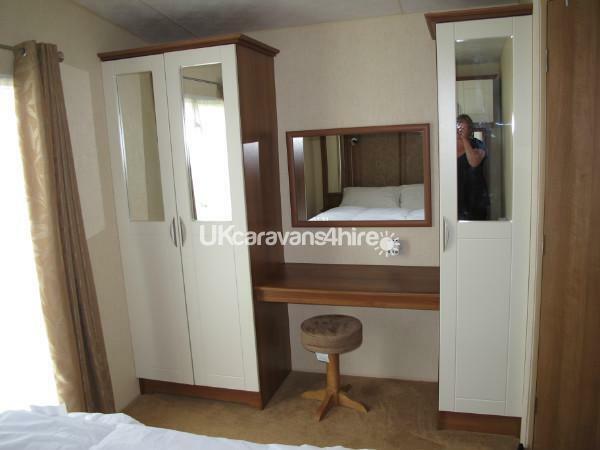 It has a double bed with cupboards over, a good size double wardrobe and a single wardrobe with fitted shelves. There is also a dressing table and stool. Leading off from here is the en-suite providing a second toilet and wash basin. •Bedroom two has two single beds, wardrobe, drawers and over-bed storage. •Bedroom three has two single beds. It has a wardrobe and over bed storage. Duvets and pillows are provided. All you need to bring is your own bed linen although we can provide this for a small additional cost (please ask when booking). 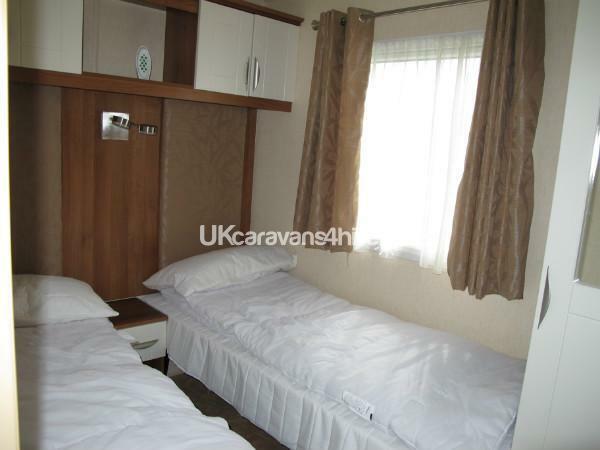 The caravan has a good size main bathroom fitted with a double shower with folding glass shower screen. The cupboard and shelves provide more than enough storage for toiletries. 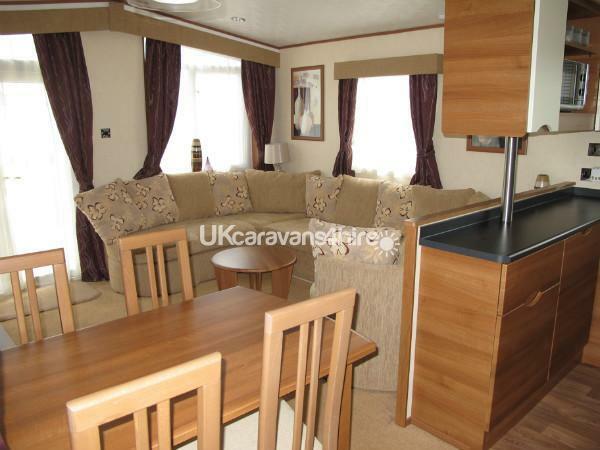 For those cooler months the caravan is fully fitted with central heating and is double glazed. 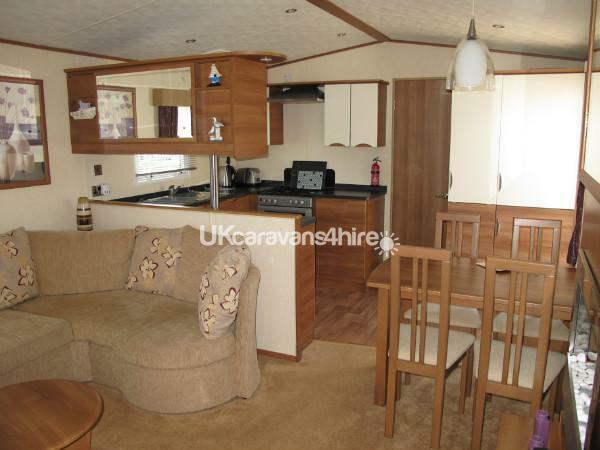 The caravan is located on what we think is one of the best pitches on the Kingfisher Caravan Site. It is just a minutes walk to the site entrance or in the opposite direction to the children’s park. The veranda wraps around three sides of the caravan. 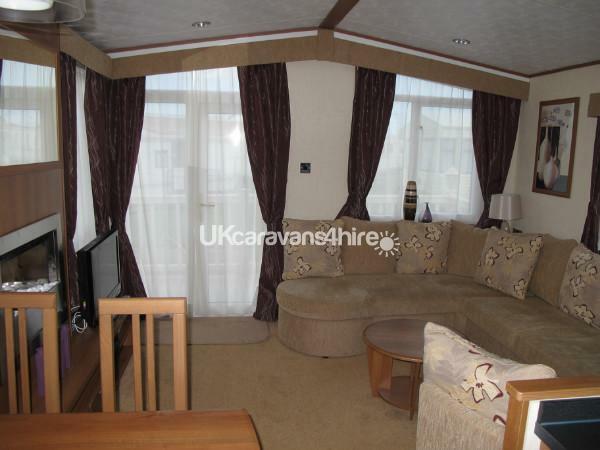 The French doors at the front of the caravan lead out to a small seating area and then continues around the side of the caravan giving access to the main door. 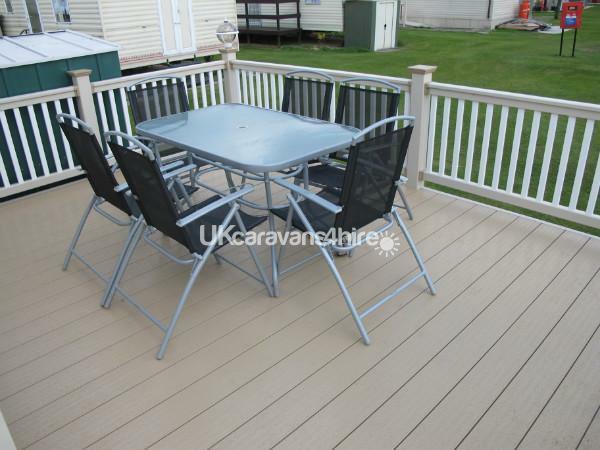 The veranda then leads to a larger 12ft x 15ft area at the back of the caravan where it is sunny and more private. There is lots of space for eating outside, using the BBQ ( on the grass around the caravan) or just relaxing in the sun. The caravan is directly off one of the site roads with hard standing for parking the car. Behind the caravan is a more secluded grassy area, ideal for paddling pools or picnics. 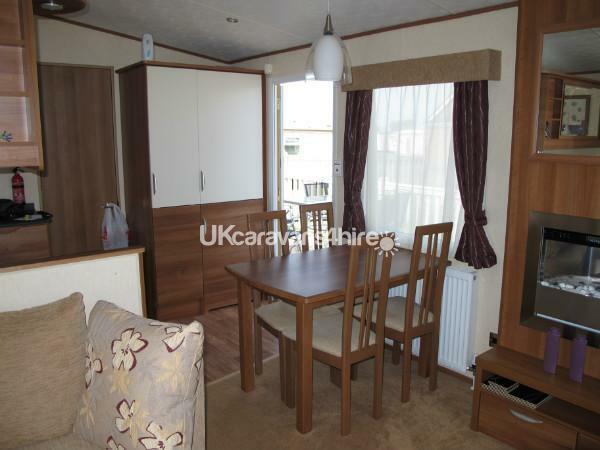 Beside the caravan is a storage shed which is very useful for storing your bulky items such as suitcases, prams and beach essentials. 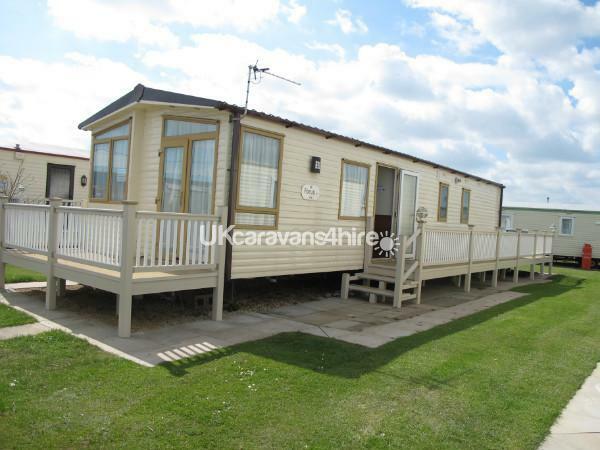 The Kingfisher Caravan Site is considered one of the best in Ingoldmells. It is ideally situated for all the attractions of Fantasy Island and markets which are a two minute walk from the caravan. The Kingfisher Caravan Site has many facilities including a large children’s park, well stocked shop and launderette. BJ’s entertainment centre is located by the site’s entrance. This provides evening entertainment every night, including some fantastic tribute acts, a roller skating rink, cash bingo, indoor play area for the children, amusement arcade and their ‘big breakfast’ meals are not to be missed. If you’re planning a day at the beach, it is only a short walk away. 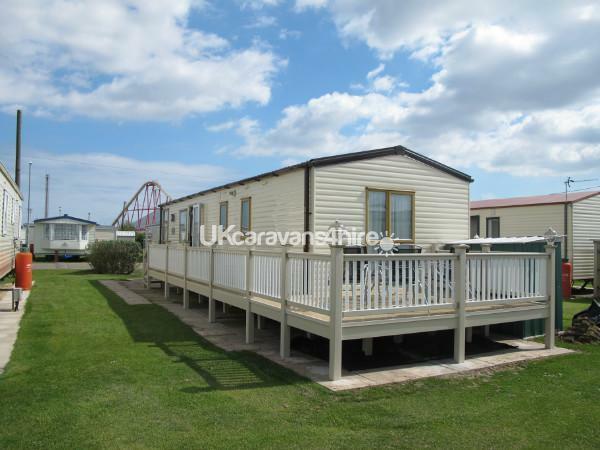 Alternatively take the free open top train which travels regularly around the Kingfisher Caravan Site and Coastfields site and has a stop just across the road from the beach. The bond will be refunded, after your holiday, when the caravan has been vacated in a clean condition with no major damage. We have tried to provide everything that you could need for a comfortable holiday so that all you need to bring are towels, tea-towels and bed linen. If you don't want to bring your own bedding we can make up your beds using our own bed linen for an additional charge of £15 per double bed and £10 per single bed. We can also provide towel packs. Please ask about this when booking the caravan. Additional Info: All the attactions of Fantasy Island and the many shops/entertainment are a two minute walk away.